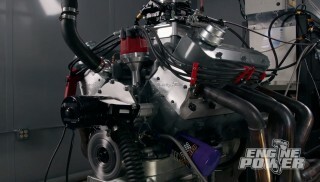 (ANNOUNCER)>> CAN MIKE AND PAT GET MORE POWER FROM A SUPERCHARGED SIX POINT TWO LSA? THE QUEST BEGINS, PLUS MORE DISTRIBUTOR TECH TODAY ON ENGINE POWER. (MIKE)>> TODAY ON ENGINE POWER WE'RE DIGGING INTO A PRODUCTION POWER PLANT FROM GENERAL MOTORS THAT EARNED ITS FAME AS THE MOST POWERFUL ENGINE IN CADILLAC'S 113 YEAR HISTORY. NOW IT WAS SO POPULAR IN THE CTSV PLATFORM IT LATER FOUND ITS WAY BETWEEN THE SUBFRAME RAILS OF THE 2012 ZL ONE CAMARO. 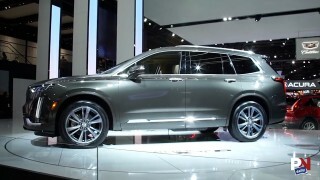 NOW IN CADILLAC TRIM IT PRODUCED 556 HORSEPOWER AND IN CHEVY TRIM 580. 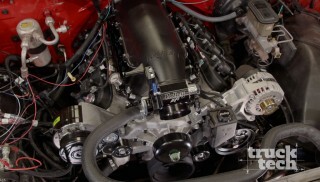 IT IS THE SIX POINT TWO LITER SUPERCHARGED LSA. THE BLOCK IS A UNIQUE ALUMINUM CASTING THAT HAS PROVEN ITSELF IN STRENGTH AND DURABILITY. NOW IT HAS A FOURZERO-65 BORE AND A THREE POINT SIXTWOTWO INCH STROKE, MAKING IT 376 CUBIC INCHES. SIX BOLT CROSS BOLTED MAIN CAPS ARE A BIG PLAYER IN ITS STRENGTH. THE CYLINDER HEADS ARE ROTOCAST 356 TSIX ALUMINUM WITH 260cc INTAKE PORTS AND 80cc EXHAUST PORTS. VALVES ARE TWOONE-65 AND ONEFIVE-90 RESPECTIVELY. COMBUSTION CHAMBERS ARE 69.8cc, FOR A COMPRESSION RATIO OF NINE POINT ONE TO ONE. THE SUPERCHARGER IS A SIXTH GENERATION ONE POINT NINE LITER WITH FOUR LOBE HIGH TWIST ROTORS. IT HAS A BROAD RANGE TO PRODUCE EXCELLENT LOW END TORQUE AND NOT SKIMP ON HIGH END HORSEPOWER. (PAT)>> AS THIS BUILD PROGRESSES YOU'LL SEE THE TRICK INTERNAL ENGINEERING THAT GM HAD TO DO TO GET THE NUMBERS AND RELIABILITY FROM THIS POWER PLANT. (KYLE)>> SO WHAT'S OUR JOURNAL SIZE? (CHRIS)>> THEY'RE JUST A TICK UNDER THE LOW. THROUGH THE BLOCK MACHINING AND CYLINDER HEAD PROGRAMS. CHRIS WE SENT YOU GUYS THE STOCK LSA HEADS AND THE SUPERCHARGER. TELL ME WHAT YOU DID WITH THEM DOWN AT THE SCHOOL. THROUGH THE CNC PROGRAM. WE'VE DONE A LOT OF R&D ON THE LS SERIES OF HEADS. 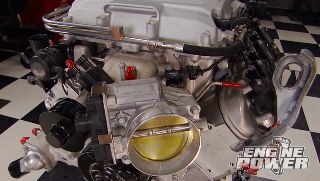 THE LSA IS VERY SIMILAR TO THE LS THREE. SO WE WENT THROUGH THE HEADS. THEN WE GAVE THE BLOWER TO THE CYLINDER HEAD DEPARTMENT, WHERE THAT WAS HAND PORTED TO MATCH THE CNC INTAKE RUNNERS, AND THEN WE PORTED THE INLET AND THE OTHER PASSAGES IN THE BLOWER. (MIKE)>> VERY NICE, NOW WITH THE OTHER PARTS ON THIS TABLE WHAT'S YOUR PREDICTION ON POWER? (CHRIS)>> EASILY 750, MAYBE 800. (MIKE)>> AND THAT'S WHAT ABOUT OVER STOCK? (MIKE)>> LET'S SEE IT, LET'S GET STARTED. (PAT)>> AND THAT ALL STARTS RIGHT HERE. 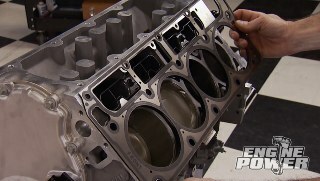 THIS LSA SHORT BLOCK IS THE FOUNDATION FOR OUR BUILD. NOW WE'RE NOT JUST GONNA ZING THIS THING APART AND THROW ALL THE PIECES IN A CRATE. WE'RE GONNA CAREFULLY DISASSEMBLE IT TO SHOW YOU THE FEATURES AND ENGINEERING OF THIS EXCEPTIONAL FACTORY ENGINE AND IT ALL STARTS AFTER THE BREAK. (MIKE)>> WE'RE BACK AND PUTTING CHRIS AND KYLE FROM SAM TO WORK. NOW THE EXTERNALS WILL COME OFF FIRST, STARTING WITH THE BALANCER. IT TURNS THREE BELTS. THE REAR FOUR RIB TURNS THE A/C COMPRESSOR, THE CENTER SIX RIG TURNS THE POWER STEERING, ALTERNATOR, AND WATER PUMP, AND THE FRONT EIGHT RIB TURNS THE SUPERCHARGER. THE OIL PAN IS A SIX QUART UNIT THAT IS CAST WITH BOSSES FOR A LIQUID TO AIR OIL COOLER. TOTAL CAPACITY FOR THE ENGINE IS EIGHT QUARTS. THE TIMING COVER IS NEXT. IT HOUSES THE CAM SHAFT SENSOR. KYLE WHAT WERE SOME OF THE KEY SELLING POINTS THAT MADE YOU ATTEND THE SCHOOL OF AUTOMOTIVE MACHINISTS? (MIKE)>> BEHIND THAT COVER IS THE CRANK DRIVEN OIL PUMP. IT'S MORE POWERFUL THAN NATURALLY ASPIRATED LS THREE AND L-99 ENGINES, AND THE UNIQUE SPRING STYLE TENSIONER KEEPS THE CHAIN TAUGHT. USING A FLAT SCREW DRIVER APPLY TENSION AND LOCK IT IN PLACE WITH A PIN FOR REMOVAL. A SINGLE ROW TIMING SET MAKES THE LINK FROM THE CRANK TO THE CAM SHAFT. NOW THE CAM RETAINING PLATE IS REMOVED AND THE CAM IS SPUN A COUPLE OF ROTATIONS. THAT PUSHES THE LIFTERS INTO THE LIFTER RETAINERS. THIS ALLOWS CAM SWAPS WITH THE HEADS STILL INSTALLED. BY REMOVING THE FASTENER, THE TRAY, AND FOUR LIFTERS CAN BE REMOVED TIMES FOUR. THE CAM SHAFT IS NEXT TO COME OUT. IT'S A HYDRAULIC ROLLER WITH VERY MILD SPECS. REMEMBER, IT HAS TO MEET EMISSIONS. (PAT)>> WITH THE ENGINE ROLLED OVER, CHRIS WILL REMOVE THE WINDAGE TRAY, WHICH KEEPS OIL FROM INTERRUPTING THE FLOW INTO THE OIL PUMP. ANOTHER UNIQUE FEATURE TO THIS ENGINE ARE PISTON SQUIRTERS. THEIR JOB IS TO KEEP THE BOTTOM OF THE PISTON COOL SINCE EXTRA HEAT IS GENERATED FROM ADDITIONAL CYLINDER PRESSURE FROM THE SUPERCHARGER. THE RODS ARE POWDERED METAL AND USE A CRACKED CAP. THAT MEANS THE ROD IS MADE AS ONE PIECE AND THE BIG END IS LITERALLY BROKEN IN A CONTROLLED MANNER, MAKING THE TWO PIECES UNIQUE TO EACH OTHER. NO MIXING UP CAPS HERE. THE MAIN CAPS ARE TYPICAL OF AN LS ENGINE. THEY USE TWO SIDE BOLTS AND HAVE A FOUR BOLT MAIN. THIS CRANKSHAFT IS UNIQUE TO THE LSA. IT'S A DROPPED FORGED STEEL PIECE THAT WILL HANDLE IN EXCESS OF 1,000 HORSEPOWER. (MIKE)>> THE LSA CRANK USES AN EIGHT BOLT FLANGE FOR ADDITIONAL CLAMPING STRENGTH AND ALSO HAS A 58 TOOTH RELUCTOR WHEEL, COMPARED TO A NATURALLY ASPIRATED SIX POINT TWO LITER THAT USES A SIX BOLT CRANK. THE EIGHT BOLT CRANKSHAFT IS INAPPLICABLE TO US SINCE WE'RE RUNNING A TRICK AFTERMARKET FLEX PLATE AND SIX SPEED AUTOMATIC TRANSMISSION. 60 THOUSANDTHS CLEARANCE. WITH OUR GRINDING COMPLETE, WE'LL LAY THE CRANK BACK IN AND VERIFY OUR CLEARANCE. IF EVERYTHING CHECKS OUT THE BLOCK WILL GO IN THE WASHER FOR A FINAL CLEANING. (KYLE)>> THE NEW CRANKSHAFT CAME WITH A 58 TOOTH RELUCTOR WHEEL AND IT NEEDS TO BE INSTALLED. FOR THAT WE'LL USE THIS GOODSON FIXTURE AND A LITTLE BIT OF HEAT. THE RING CAN BE PRESSED ON OR HEATED LIKE THIS. DO IT IN A ROTATING MANNER SO IT'S HEATED EVEN AND EXPANDS ENOUGH SO YOU HAVE TIME TO ALIGN AND LOCATE IT. IT ONLY GOES ON ONE WAY. (PAT)>> WE'RE BACK AND CONTINUING ON THIS LSA BUILD. IT'S TIME TO CHECK THE BEARING CLEARANCES. NEW COATED CLEVITE BEARINGS ARE PLACED IN THE MAIN SADDLES AND THE CAPS. THEN THE CAPS ARE TORQUED TO FACTORY SPECS. LUNATI FORGED HBEAM RODS. THEY HAVE A SIX-125 CENTER TO CENTER LENGTH AND A BRONZE BUSH SMALL END. FINISHING THEM OUT IS AN ARP 2,000 ROD BOLT. HOW MUCH THE FASTENER IS STRETCHED WHEN IT'S TORQUED. AS PER LUNATI SPECS, THE BOLT STRETCH SHOULD BE BETWEEN FIVE AND FIVE AND A HALF THOUSANDTHS, WHICH SHOULD HAPPEN BETWEEN 65 AND 75 POUND FEET. AND WE'RE IN THE GREEN ZONE. JUST LIKE THE MAINS, THE CLEARANCE IS CHECKED, THEN RECORDED ON THE BUILD SHEET. (MIKE)>> DSS RACING SUPPLIED THE CUSTOM PISTONS FOR THIS BUILD. WALL CLEANER, WHICH REDUCES THE OIL LOAD ON THE OIL RING. TOTAL SEAL SUPPLIED THE RING PACK. IT SPORTS A THREE MILLIMETER CHROME FACED OIL RING. THE SECOND IS CAST NAPIER, AND THEIR C-33 COATING IS ON THE STAINLESS STEEL TOP RING. TOTAL SEAL ASSEMBLY LUBE WILL COAT THE RINGS AND SKIRTS FOR INSTALLATION. WITH CLEAN AND LUBED CYLINDERS THE PISTON AND ROD ASSEMBLIES ARE GOING IN. USING A PISTON KNOCKER, CAREFULLY DRIVE THE PISTON THROUGH THE COMPRESSOR MAKING SURE A RING DOES NOT CATCH THE DECK. ALSO BE CAREFUL DOWN LOW THAT THE ROD DOES NOT NICK THE ROD JOURNAL. TO 75 POUND FEET. WE HAVE A ROTATIONAL TORQUE OF 14 TO 15 POUND FEET. BY COMPARISON A 350 SMALL BLOCK CHEVY IS 35 TO 40. (CHRIS)>> NAH, THAT'S GOOD OIL RING FOR THE COMBO TOO. CAM SHAFT THAT'S BEEN CUSTOM GROUND TO ONE OF HIS SIGNATURE PROFILES. DURATION AT 50 IS 231 DEGREES ON THE INTAKE AND 248 DEGREES ON THE EXHAUST. THE LOBE SEPARATION ANGLE COMPLIMENTS OUR SUPERCHARGED APPLICATION AND DRIVABILITY AT 120. LIFT AT THE VALVE WITH A ONESEVEN ROCKER IS 617 AND 595. NOW A BRONZE THRUST PLATE FROM COMP CAMS IS INSTALLED, ALONG WITH THE FACTORY CHAIN GUIDE AND TENSIONER. A COMP CAMS SINGLE ROW HEX ADJUST TIMING SET IS NEXT. AND FINALLY WE CAN DEGREE THE CAM SHAFT. THE LIFTERS ALSO CAM FROM BRIAN TOOLEY RACING. THEY ARE HYDRAULIC ROLLERS THAT WILL DROP IN WITH THE RETAINER TRAYS. (MIKE)>> ALRIGHT GUYS, WE MET THE GOAL OF GETTING THE SHORT BLOCK TOGETHER. THANKS AGAIN FOR ALL THE HELP. WE GREATLY APPRECIATE IT. (PAT)>> PLEASURE TO SEE YOU. (MIKE)>> HAVE A GOOD RACE. 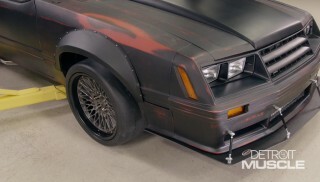 (ANNOUNCER)>> LOCKING OUT A DISTRIBUTOR FOR TUNING AND PERFORMANCE CONTROL, THAT'S NEXT! INLET AND THE OUTLET BY HUBBARD RACING. THAT ALLOWS FOR A BETTER OIL FLOW RATE TO BETTER PROTECT THE ENGINE. THE PRESSURE SPRING IS SHIMMED FOR HIGHER IDLE PRESSURE AND YOU CAN ORDER YOURS FROM BRIAN TOOLEY RACING. WITH ALIGNMENT SHIMS INSTALLED, TIGHTEN AND TORQUE IT IN PLACE. REAR TO ALIGN IT WITH THE BLOCK. NOW TIGHTEN IT DOWN. THIS ENGINE IS IN FULL SHORT BLOCK STATUS, AND I MUST SAY IT'S A PRETTY BULLETPROOF COMBINATION. NOW THERE'S STILL PLENTY OF TRICK PARTS TO GET IT TO THE STAGE OF DYNO READY. APPLIES TORQUE TO THE FASTENER SIDES, REDUCING CORNER ROUND OFF. HIGH VISIBILITY MARKINGS WILL KEEP YOU FROM REACHING FOR YOUR GLASSES AS WELL, AND THEY'RE AVAILABLE IN QUARTER, THREEEIGHTHS, AND HALF INCH DRIVE SETS. LOCATE A MATCO DISTRIBUTOR OR CHECK THEIR WEBSITE FOR PRICES. (MIKE)>> HERE'S A NEW PRODUCT FROM DESIGN ENGINEERING INC, OR DEI. THIS IS THEIR NEW ONYX SERIES FLEXIBLE HEAT SHIELD THAT IS MADE OUT OF A COMBINATION OF ADVANCED TEXTILES TO PRODUCE ONE OF THE BEST HEAT SHIELDS ON THE MARKET. NOW IT'S MADE FROM HEAT TREATED GLASS FIBER AND MOLTEN ALUMINUM THAT ARE FORMED INTO A TIGHT WEAVE. TO 20 PERCENT WEIGHT SAVINGS OVER A SAND CAST ONE. IT'S DESIGNED USING COMPUTATIONAL FLUID DYNAMIC SOFTWARE FOR SUPERIOR FUEL DISTRIBUTION AND MORE POWER. IT'S FOR OVAL OR SQUARE PORT CYLINDER HEADS AND COMES WITH EITHER A DOMINATOR FLANGE OR A 4150 SERIES. PLUS IT EVEN COMES WITH FUEL RAILS. GET YOURS FOR AROUND $315 BUCKS FROM SUMMIT RACING. PART OF ENGINE TUNING AND HAVING TOTAL CONTROL OF THE TIMING HELPS MAXIMIZE AN ENGINE'S OUTPUT. NOW THE DISTRIBUTOR IS WHAT DICTATES WHEN THE ENERGY FIRES THE SPARK PLUG. SO TODAY WE'RE GONNA SHOW YOU HOW TO LOCK ONE OUT. MOST DISTRIBUTORS YOU DEAL WITH HAVE A TIMING CURVE IN THEM. THAT MEANS WHEN THE ENGINE IS IDLING THE TIMING IS SET AT ITS MINIMUM POSITION. AS THE RPM'S ARE INCREASED, WEIGHTS AND SPRINGS IN THE DISTRIBUTOR MOVE THE POSITION OF THE ROTOR TO ADVANCE TIMING, SOMETIMES AS MUCH AS 24 DEGREES. MAIN SHAFT AND REMOVE THE NUT AND WASHER ALONG WITH THE ADVANCE BUSHING. ROTATE THE ROTOR SHAFT 180 DEGREES AND ALIGN IT WITH THE HOLE ON THE OPPOSITE SIDE, SECURE IT DOWN. REPLACE THE BUSHING AND TAP THE ROLL PIN BACK INTO PLACE. WITH ALL OF OUR UNUSED PARTS LEFT ON THE TABLE THE ROTOR CAN GO BACK ON. NOW THERE'S NOTHING LEFT IN THE DISTRIBUTOR THAT WILL CAUSE A TIMING VARIANCE AT ANY RPM, AND THAT'S HOW YOU LOCK OUT A DISTRIBUTOR. (MIKE)>> WELL THAT'S IT FOR STAGE ONE. MAKE SURE YOU CHECK OUT STAGE TWO, WHICH IS COMING UP SOON. WE'LL SEE YOU NEXT TIME.